On the surface, Letcher County, Ky., is one of the sickest American counties when it comes to health and wealth. A region that once was economically dependent on the coal industry has seen more than 8,000 workers lose their jobs over the last four years. 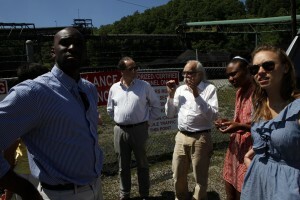 The EEGLP team meets with Whitesburg community members at Appalshop’s office. A closer look, though, reveals a thriving cultural hub poised to transform a devastated economy. But how does a community leverage its existing assets to create such a turnaround? That is the question at the heart of a partnership between Lafayette’s Economic Empowerment and Global Learning Project (EEGLP) and Appalshop, a nonprofit arts and education center that produces original films, video, theater, music and spoken-word recordings, radio, photography, multimedia, and books to help preserve the rich culture of Appalachia. 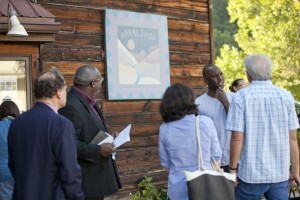 The incredibly successful collaboration has become a national pilot program for Imagining America: Artists and Scholars in Public Life, a national consortium of institutions dedicated to creating democratic spaces to nurture scholarship that draws on the arts, humanities, and design to benefit not only higher education but communities across the country. The initiative – called Performing Our Future – will enable three communities in different geographic locations to deploy the EEGLP model, combining the expertise of economists and artists to advance economic development driven by cultural assets. The next step takes place this July when EEGLP will co-host a national institute for colleges across the country at Appalshop. Participants will explore what’s taking place in Letcher County and create an arts- and culture-based development plan to take back to their home community. Instead of taking a top-down bureaucratic approach, EEGLP uses a collaborative model in which teams of students and faculty work hand-in-hand with residents to tackle economic issues, placing the power where it belongs – with the community that is seeking change. The EEGLP team is there to learn and consult, not instruct. 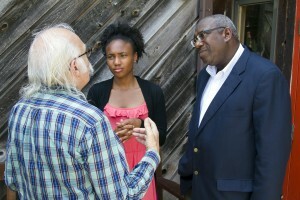 Drew Davis ’17 and Professor Hutchinson speak with Appalshop’s Herb Smith. That approach makes all the difference, explains Gladstone “Fluney” Hutchinson, associate professor of economics, founding director of EEGLP, and Imagining America board member. Hutchinson and Scott Peters, professor in the Department of Development Sociology at Cornell University and faculty co-director of Imagining America, will be co-principal investigators of Performing Our Future’s research. “The core lesson of this pilot project: the richness and productivity of the collaboration under publicly engaged scholarship and Imagining America’s rootedness in the importance of the centrality of the arts, humanities, and design disciplines in this process, allows the vehicle of science and scientific processes to frame and explore more meaningful questions,” Hutchinson says. An initial team of four students began working with Appalshop in the summer of 2014 to identify and map the organization’s assets as well as identify and test entrepreneurial strategies for wealth creation. The project is currently in its second phase of looking for ways to market those assets and will continue through the summer of 2017. A team of five students is working under the direction of Hutchinson and Michael Kelly, associate professor of economics, with three more students set to join the project this summer. The team takes a tour of Whitesburg. Performing Our Future is funded by the Doris Duke Charitable Foundation, ArtPlace America, and the National Endowment for the Arts. Lafayette’s participation also is supported, in part, by a generous gift from trustee George Jenkins ’74.